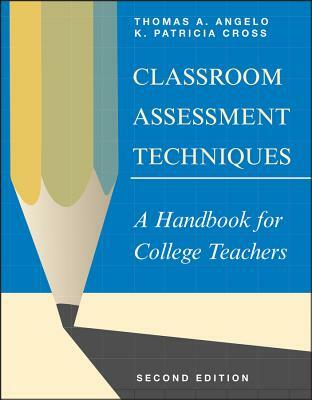 * What classroom assessment entails and how it works. * How to plan, implement, and analyze assessment projects. * Twelve case studies that detail the real-life classroomexperiences of teachers carrying out successful classroomassessment projects. THE AUTHORS THOMAS A. ANGELO is founding director of the Academic Development Center at Boston College. He is coauthor (with K.P. Cross) of the 1988 edition of Classroom Assessment Techniques and editor of Classroom Research: Early Lessons from Success (1991) in the Jossey-Bass New Directions for Teaching and Learning series. K. PATRICIA CROSS is the Elizabeth and Edward Conner Professor of Higher Education in the Graduate School of Education at the University of California, Berkeley. She is the author of six other books, including Adults as Learners (Jossey-Bass, 1981).